Located in the higher midlands of Malaysia, Cameron Highlands presents the perfect weekend getaway opportunity if you’re looking to escape the heat and humidity of Kuala Lumpur or Penang. Several places to visit in Cameron Highlands and the cool air and refreshing ambience of the hill retreat, which has a mean annual temperature of about 18 °C, provide some entertainment and welcome relief from the stuffy lowland heat! Some of the Cameron Highlands trekking trails provide a good workout too! 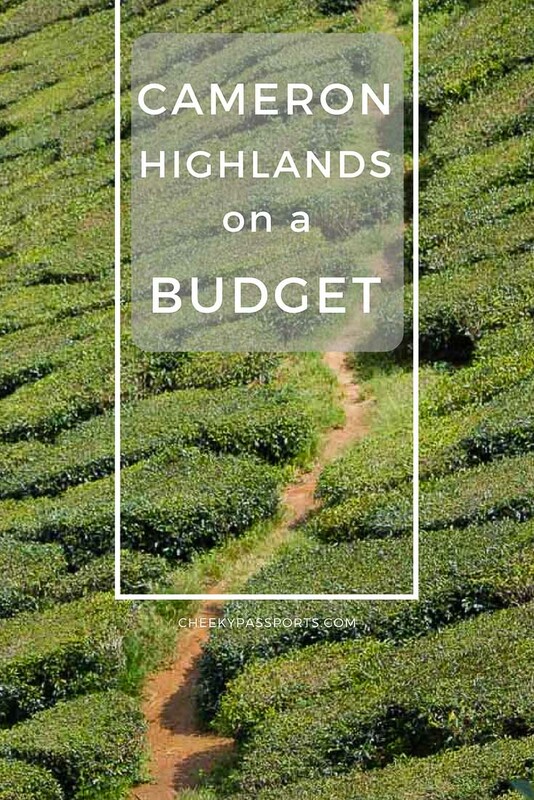 The resorts in the highlands do not seem to cater directly to backpackers, nor are they cheap, but we found that there are several places to visit in Cameron Highlands if you’re travelling on a budget, so you can easily take in some Cameron Highlands attractions without having to break the bank! 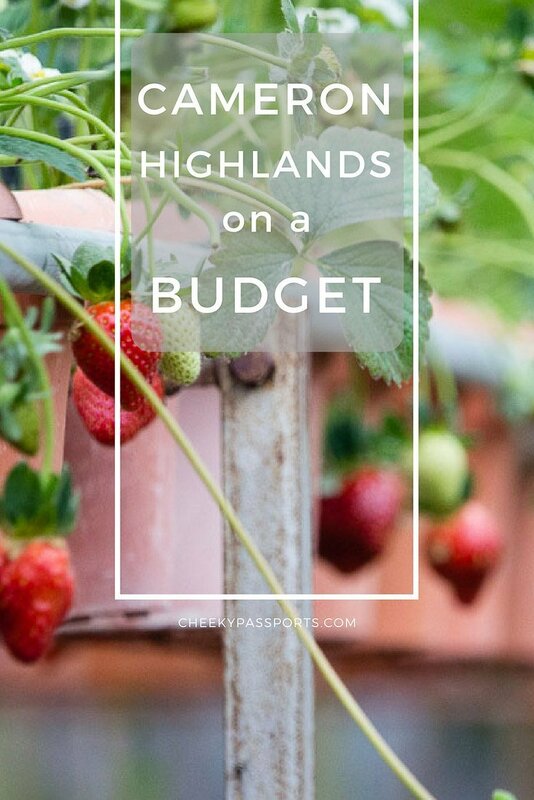 During our stay there, we noted that most people in Cameron Highlands were not budget travelers, but rather Malaysian families from the lowlands and young, happy-looking European couples (who we assumed were on honeymoon). The places to visit in Cameron Highlands seem to cater directly to such travelers. Cameron Highlands is actually a group of nine separate towns stretching along a route of 35km, each with its own cultural identity. Tanah Rata and Brinchang are the most popular areas among tourists and both can be used as a base from which to explore the Cameron Highlands attractions. The British colonial legacy is still very much evident in Cameron Highlands. Black (or English) tea, ripe strawberries and delicious home-made scones with (alas, not clotted) cream are the order of the day. Indeed, tea was first planted here by a British chap in the 1920’s and the estates, along with fruit and vegetable farms and flower nurseries, are very popular with tourists in the area, and have greatly contributed to the growth of economy of this hill station. Many of the places to visit in Cameron Highlands involve tea production or strawberry cultivation! Buses to Cameron Highlands leave very frequently from Kuala Lumpur’s very organised BST terminal (Bersepadu Selatan). The journey lasts about 5 hours (including a toilet break) and costs 35 Malaysian Ringgits (RM) – about €7. A large part of the road is winding, so take the necessary precautions if you suffer from road sickness. It is worth noting that buses in Malaysia tend to be very comfortable, so we found bus travel to be a very convenient and affordable means of transportation! Buses can be easily booked online with Easybook or 12Go Asia. There are lots of upmarket resorts and hotels in Cameron Highlands, some of which are reminiscent of the highlands’ colonial era. We decided to base ourselves in the town of Tanah Rata, which is home to some budget accommodation and good location for accessing most Cameron Highlands attractions and Cameron Highlands trekking trails. The hotel we stayed at, Hotel BB Inn is located right at the centre of town and set us back about 65 RM (€13)/night. The hotel isn’t great but very affordable; our room was tiny with no external window, but included a private bathroom. It also included the use of a kettle which I greatly appreciated, since it allowed me to fuel up on my caffeine intake without having to stop in expensive cafes too often! Several agencies offer day tours to many of the places to visit in Cameron Highlands most of which cost about 100RM (€20)/person. Many of the Cameron Highlands attractions are free though, and can be done without the use of agencies. One exception of note is a trek to the jungle in search of the giant Rafflesia flower which cannot really be done independently since the trek is preceded by a one hour off-road drive to the jungle. It is unlikely that an independent tourist would know where to find a blooming Rafflessia in the jungle! The unique flower blooms at sporadic times during the year, for only seven days, and there is no guarantee that it can be seen even if you go on a tour! Without knowing whether we would actually get to see the Rafflesia, the tours didn’t seem worth going to, so we decided to skip them and visit the Cameron Highlands attractions independently, hoping that we would eventually see the flower some other place. A little food market running parallel through the main road in Tanah rata opens early evening until 8pm or 9pm and sells local fare at very affordable prices. 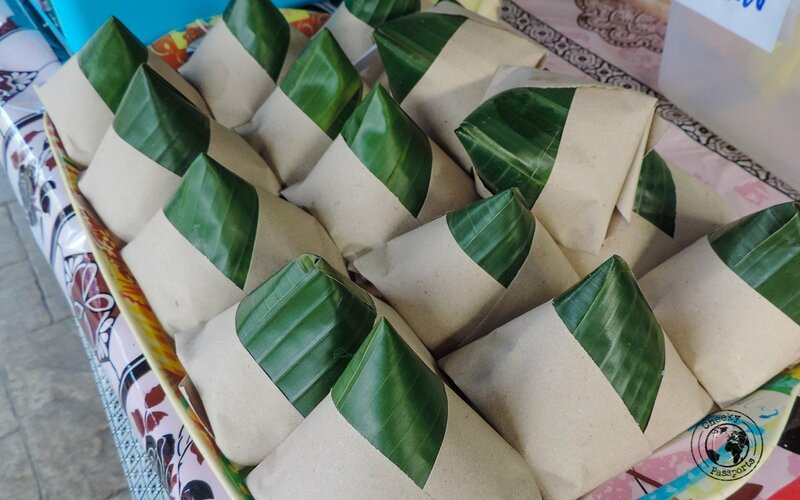 We love the street food in Malaysia so we were happy walk around and try out some of what the hawkers had on offer. The night market in Brinchang which is open once a week is a lot larger and should be on your list of places to visit in Cameron Highlands. There are four tea plantations in Cameron Highlands, the two main ones being Boh (the largest) and Bharat (the second largest), making them some of the most popular Cameron Highland attractions. One of Bharat’s plantations is located about 4km away from Tanah Rata so we decided to walk there along the main road in Tanah Rata. The road is not so busy and the walk was a pleasant downhill stroll. We had hoped to get a taxi back to town but none were available so we walked back the same way too, and rewarded ourselves with shakes and cake when we were back in town. The plantation, located on the road, is easily recognizable because of a large café and souvenir shop selling tea and tea products (at a rather high premium). The viewing platform to the plantation was inaccessible as it was being extended, but the estate is easily visible from the road. There is also an entrance to a path leading to and around the plantation. The views over the plantation are spectacular! 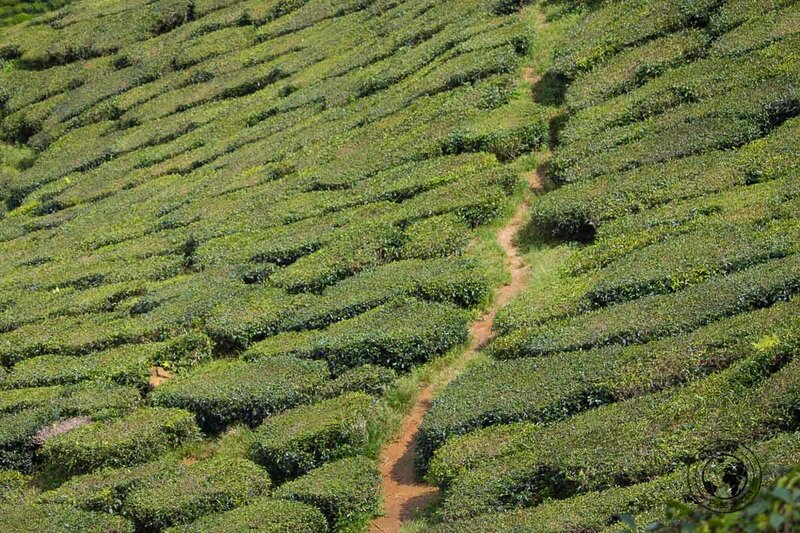 Be sure to put the tea plantations on your list of places to visit in Cameron Highlands! We always promote independent travel, but if you need a little help visiting the tea plantations, check the tours on Viator. 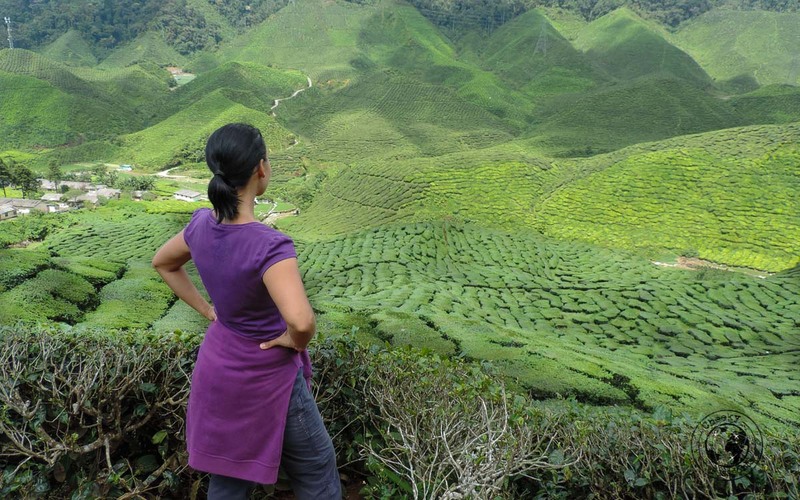 Cameron highlands trekking is a great activity, especially if you’re traveling on a budget! 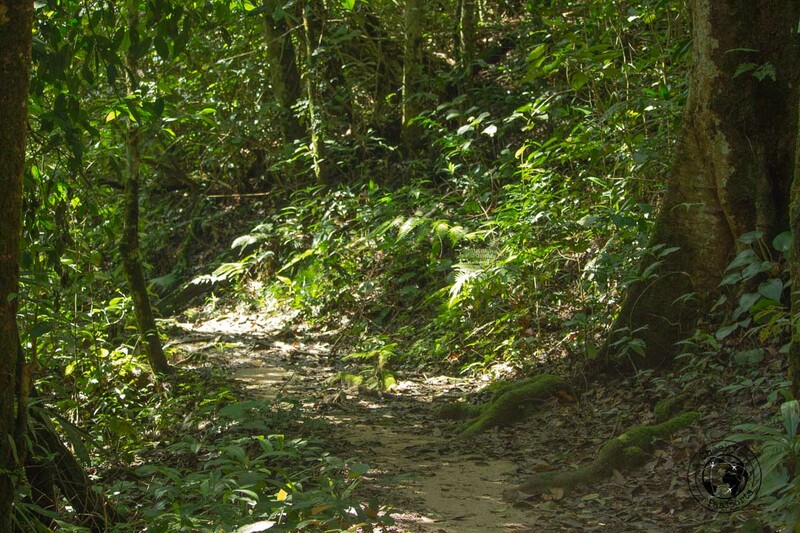 There are around 14 different jungle trails around the area (conveniently numbered and marked). Do check with your hotel about route updates for Cameron Highlands trekking since some of the routes were closed when we were there. We took Trail 10 which is a moderately tough trek up to Gunung Jasar and which can be done by any person of average fitness. The trail starts from Oly Apartments and goes into Camelia Garden through a loosely marked path on the left of the garden. There is some signage on this trail but it is generally not very well-marked. The views from the top are good but not exceptional, however we found the walk to be pleasant enough, despite the jungle being very humid. Wear good shoes and take plenty of water. After you reach the peak, you can either go back the same way or continue further on the trail which leads to a power station, a housing estate and then back to town via the main road. This part was incredibly muddy and not particularly beautiful due to a lot of construction going on at the time of trekking. The other treks include easy walks and tougher climbs. All in all Cameron Highlands trekking combines a good workout with jungle scenery. The English legacy is very evident in Cameron Highlands’ cafes, most of which serve freshly backed scones along with the black tea produced in the region. 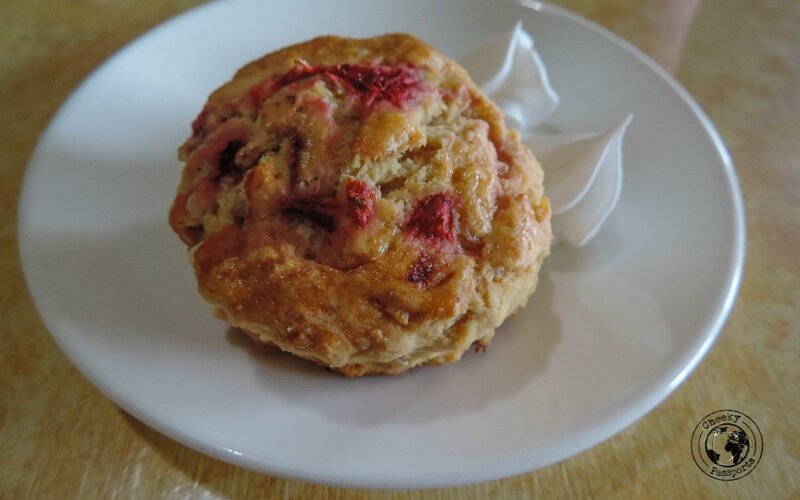 Our favourites were the strawberry scones topped up with cream and jam at The Lord’s Café. We thought the name of this café sounded very British, but it turned out to be a Christian place! 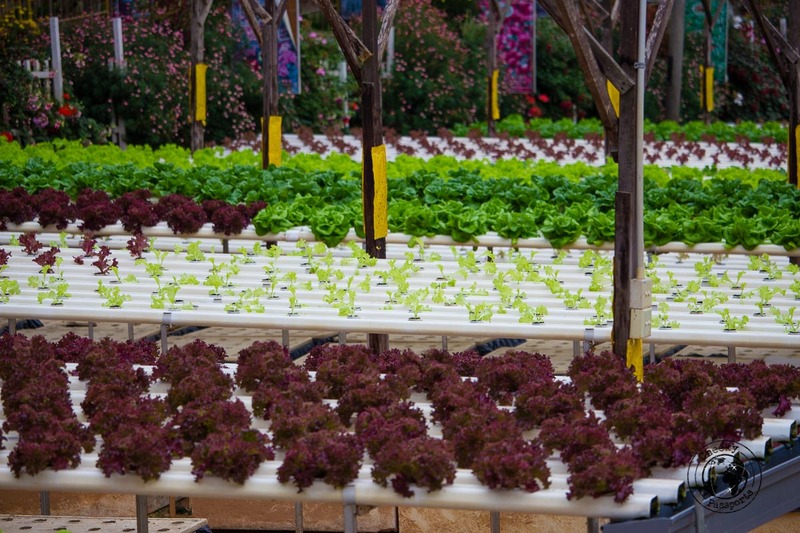 Cameron Highlands’ mild climate and fertile soils provide the ideal environment for growing several types of vegetables and fruits, particularly strawberries, so it is not surprising that fruit products are plentiful in the region, making farms popular places to visit in Cameron Highlands. Some of the farms provide facilities for strawberry picking and have cafes where you can sample the local produce. We had some great strawberry shakes at the Big Red Strawberry Farm in Brinchang! Taxi rides in Cameron Highlands are not cheap when compared to other transport options in Malaysia – 15 RM (€3) for a one-way ride from Tanah Rata to Brinchang or vice versa. Still, there are currently no buses serving the highland villages and it is too far to walk. Our plan was to visit the Mossy Forrest on our last day in Cameron Highlands but it started pouring heavily just as we were setting off. With no indication of the rain stopping, we were happy to just chill over a pot of hot tea and warm scones instead! The Mossy Forest is so-called because the trees and the earth are all covered in a thick moss. It is usually visited via tours (which also include a number of other places) but can also be done independently. The area is not very large and guides will explain all about the flora and fauna indigenous to the forest so it might be a good idea to hire a guide during this part of your trip unless you’re an expert botanist! This South Indian restaurant was our favourite place to eat in Tanah Rata and we kept going back for more! 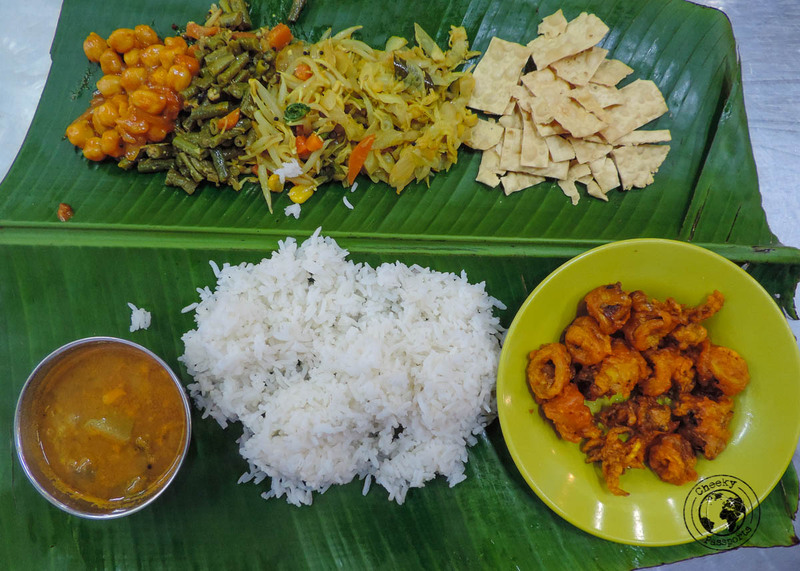 The portions are very generous and the thali, served on a banana leaf and priced at 11 RM (€2.20), is especially filling and very affordable even when you’re on a restricted budget. Best of all is that the rice and some of the other dishes included in the thali can be refilled. Great place for good food after visiting the Cameron Highlands attractions. We would never have discovered this Nyonya restaurant located just below our hotel had it not been pouring which made it impossible to walk to any part of town. 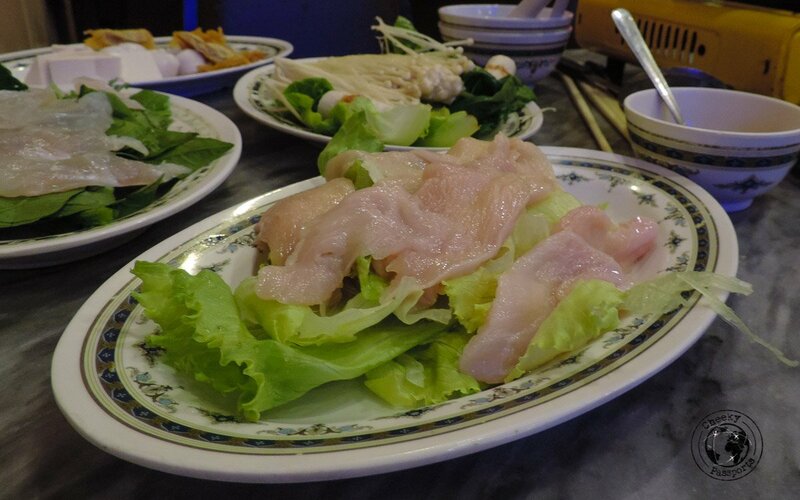 We tried the steamboat here, a dish which we saw advertised all over the town’s other Nyonya and Chinese restaurants, and which we later discovered is a very popular Malaysian food experience. The dish consists of a thin soup in a pot kept boiling over a stove at your table. Various raw ingredients are placed in front of you and you get to cook them in your own time for as long as you like. We were served with sliced chicken, sliced fish, tofu, fish balls, prawn, eggs, noodles and several types of vegetables which we cooked in Tom Yum Soup. Although it is our only steamboat experience to date, we loved it! The steamboat costs around 24 RM (€5)/person which is good value for a steamboat. Many items on the menu are a lot cheaper though! This simple budget-friendly stall is run by a couple who are speech-impaired. They run the whole show themselves so you might need to wait for a while if the place is full. 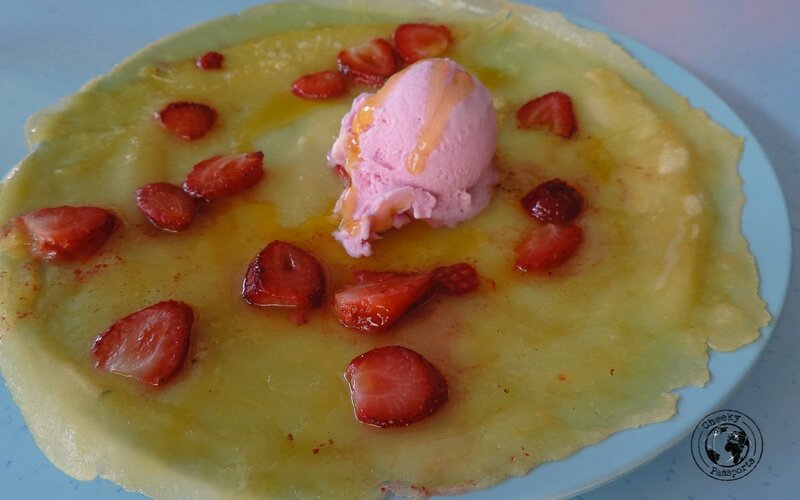 The strawberry pancakes are worth waiting for! In all honesty, Cameron Highlands was not my favourite place in Malaysia. It surely provides a welcome respite from the hot humid climate of the lowlands but I found it to be a lacking in soul and, and found many of the places to visit in Cameron Highlands to be too family-oriented and lacking some kind of challenge for my liking. Cameron Highlands trekking was probably the activity I enjoyed most, but I wouldn’t recommend visiting the area just for that either. Had it not been for the food, I could have easily imagined I was in some European mountain village rather than in Southeast Asia! It is however a very “easy” destination, and I would happily recommend the Cameron Highland attractions to families with kids and to tourists who are not ready to experience a more difficult, but perhaps more authentic Asian destination. Great tip on the anti-nausea medication for the winding roads!! I tend to forget about it when not at sea! Yeah us too! We’ve had a few “scary” bus journeys which were close to needing an emergency stop due to lack of medication! We try to remember to carry some along now! 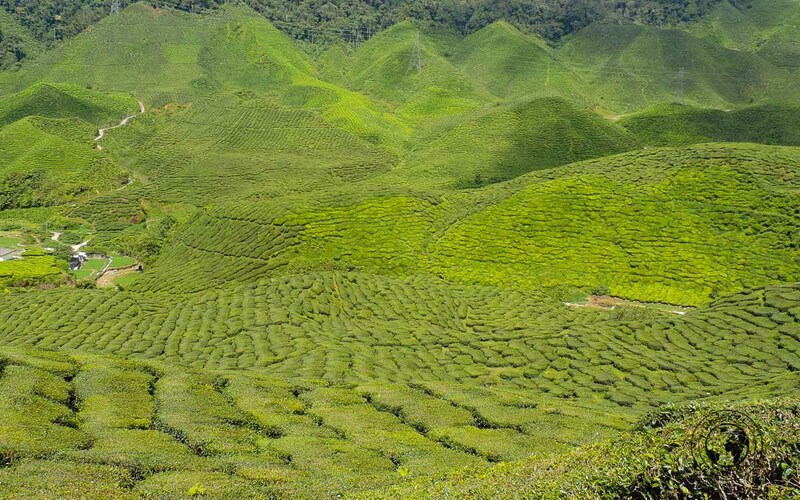 I’ve heard amazing things about the Cameron Highlands and would love to visit a tea factory and strawberry plantation! 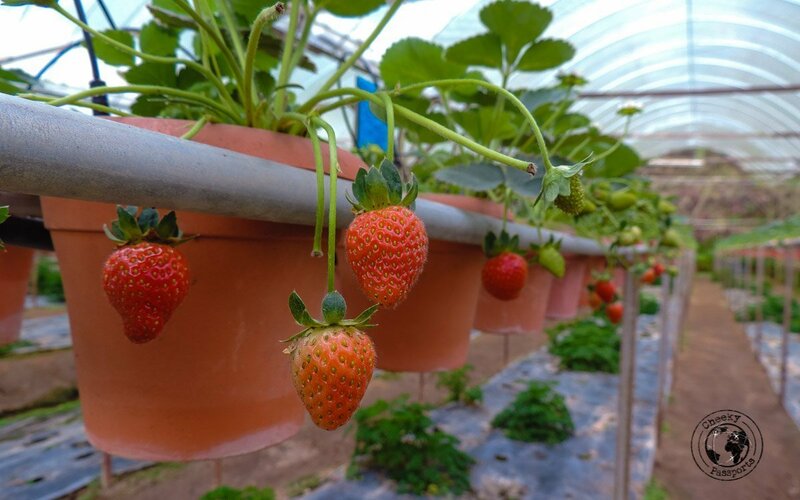 Do you know if there is a better season during the year to visit the strawberry farm? Great to know that the buses are comfortable and reasonably priced. I believe that May to August is peak season (we were there in June), however we have been told that the weather is a little “crazy” this year with rains in the dry season. Cameroon islands in indeed a beautiful place! I’ve heard much of it! Yes, because it was a British colony and how its name sounds, first I thought it’s somewhere in Europe and later learnt its in the East! Good to know that the bus costs economical from KL to here! 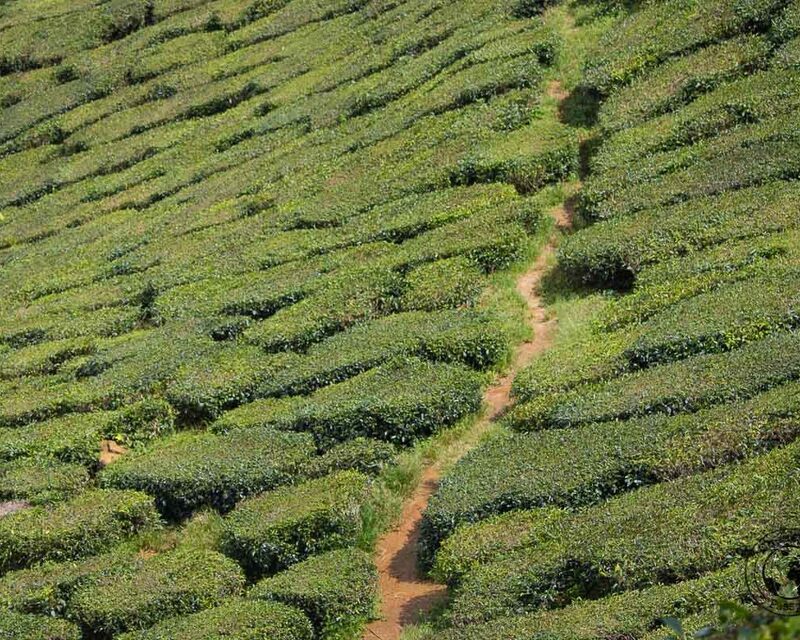 The tea plantations & trek paths look so gorgeous! While colonialism isn’t a positive thing, if I was there, I would sure love some strawberries and cream with scones! Those are magnificent views! So many different strawberry desert variations available! The tea plantations and the food reminds me of India. I haven’t considered Cameron Highlands earlier, but it does seem like a great option for Asia travel. What is the best season to go? The weather in Cameron Highlands is pretty constant the whole year round. Expect some afternoon rains all year round (it would rain heavily for about an hour and then stop). Best to avoid Nov-Jan as it is known to be slightly more wet. Happy travels! I love all the photos, so stunning! Cameron Highland looks like a serene getaway, and I can imagine it must be pleasant with the cool weather. i am visit Malaysia in Oct and would like to know if we get rented motorbikes there and from where? The Cameron Highlands look so beautiful. I love the lushness of the plating and the views are so spectacular! My mouth is watering at the food too. One for the bucket list! It is one of those places that a person must visit in his / her lifetime. It has wonderful tea gardens, and you are sure to fall in love with greenery that it offers.